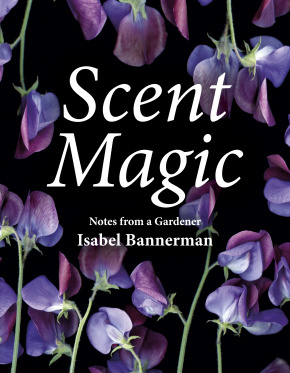 In Scent Magic, a book which is at once romantic and extremely practical, plantswoman, designer and garden-maker extraordinaire Isabel Bannerman immerses the reader in the luscious smells of the fragrant garden through a warmly written account of her year’s gardening; and combines this with an encyclopaedic reference work of the best aromatic plants to grow throughout the seasons. Whether evoking the freshly baked sponge smell emanating from wisteria, describing ‘Stanwell Perpetual’ as "the kind of rose that would taste of apricot and raspberries swirled together", or championing the magic of the Himalayan cowslip, "scented profoundly and deliciously like the dark vault of a Damascus spice merchant’" the glorious poetry of her descriptions is here joined with personal memories and a lifetime’s experience of gardening and plant cultivation. Isabel Bannerman was born in Paddington in 1962, the youngest of five children who lived in a terraced house in London's Kensington High Street. She began gardening when she met Julian Bannerman, owner of Bannerman’s Bar in the Old Town, Edinburgh, when she was at University. Together they moved to a derelict baroque mansion in Wiltshire and camped whilst restoring the house and starting to design gardens and garden buildings for a living. With a lot of luck and hard work they established a practice, winning gold medals at Chelsea and working for discerning clients such as HRH, The Prince of Wales, Andrew Lloyd-Webber and more recently George Clooney and Sting and Trudie Styler. Isabel has taken photographs since she was at school and began making her particular style of botanical scans in 2003. She has had four solo shows of her work, which is in the collections of Jasper Conran, and Richard E Grant. She writes occasional gardening pieces for the Telegraph and Sunday Times. She wrote and photographed Landscape Of Dreams (Pimpernel Press, 2016), describing fourteen gardens created by the Bannerans and their way of working together. Scent Magic is her second book, and is the result of ten years researching and note-taking on her favourite subject, scent in the garden.